Current: ANIMAL, VEGETABLE, OR MINERAL? Berkeley, CA - 16 August 2011 - You’ve read about it, you’ve heard about it, now it’s here. Up-and-coming writer Sam Humphries (CBGB, Fraggle Rock) and Steven Sanders (FIVE FISTS OF SCIENCE, Uncanny X-Men: The Heroic Age), provocative sci-fi one-shot OUR LOVE IS REAL is coming to Image Comics this November after capturing the attention of the comics industry over the summer. Set in the not-too-distant future, OUR LOVE IS REAL is a bold story about the many odd forms that love can take. 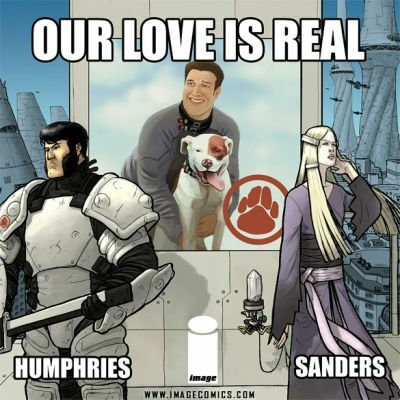 Originally self-published in limited quantities, Humphries and Sanders were eager to share their story with a wider audience following the torrent of critical accolades OUR LOVE IS REAL received from fans, the comics press and creators alike. In OUR LOVE IS REAL, the plantsexuals are rioting in the streets for equal rights, humans are falling in love with dogs, and crystals are much more than just jewelry! When a chance encounter on the job changes a riot cop’s life forever, he finds himself caught in a bizarre love triangle that blurs romance, crime, and lust beyond recognition. OUR LOVE IS REAL (SEP110383), a uniquely formatted 8 x 8 24-page black and white sci-fi satire comic for $3.99, will be available for order in the September issue of Previews and goes on sale in stores November 2.